This story was updated May 27 at 12:19 a.m. EDT. HOUSTON – Two astronauts floated outside the International Space Station in the wee hours of the morning for their mission's fourth spacewalk, marking what is expected to be the last spacewalk ever taken by a space shuttle crew. NASA has one final shuttle flight scheduled to launch after Endeavour's mission; the STS-135 flight of shuttle Atlantis in July. But, no spacewalks are planned for that mission's astronaut crew. Instead, it will be station astronauts who will tackle exterior work during Atlantis' flight, NASA officials said. The main goal for today's spacewalk is to move Endeavour's 50-foot (15-meter) Orbital Boom Sensor System (OBSS), essentially a long inspection pole tipped with cameras and laser sensors, to a new permanent home on the space station. During shuttle missions the inspection pole is attached to the end of the orbiter's robotic arm to give astronauts the reach they need to scan their vehicle's sensitive heat shield for damage. Typically, two extensive heat shield inspections are conducted – one the day after launch, and the second, after undocking from the space station prior to re-entering Earth's atmosphere for landing. More detailed, focused inspections can also be performed as needed while the shuttle is docked to the station. Early Thursday morning, Endeavour's astronauts completed one final inspection of the shuttle's heat shield using the inspection pole. Early results from that survey are positive, lead space station flight director Derek Hassman said in a news briefing Thursday (May 26). Mission managers are expected to completely clear the shuttle for landing within the next day. During Friday's spacewalk, Fincke and Chamitoff will install the pole on the starboard side of the space station's backbone-like truss. This was largely the reason why the shuttle crew conducted their final scan of Endeavour's heat shield early, rather than waiting until the usual time after undocking. The fourth and final spacewalk of Endeavour's STS-134 mission is also expected to surpass a key milestone: If all goes according to plan, approximately 4 hours and 47 minutes into today's spacewalk, the total number of hours spent spacewalking for the assembly and maintenance of the International Space Station is expected to exceed 1,000. On Friday at 9 p.m. EDT (0100 May 28 GMT), Fincke will also become the new record-holder for the number of days an American astronaut has spent in space, surpassing Peggy Whitson's total of 377 days. During an earlier spacewalk this week, Endeavour astronauts experimented with a new exercise, called In-Suit Light Exercise (ISLE), as a way to prepare for the outing. 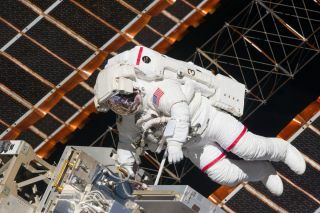 This new protocol required the spacewalkers to do some light calisthenics, such as lifting their arms and legs inside their pressurized spacesuits before exiting the station's airlock. While the test was a success, Mission Control opted to stick to the traditional campout procedure, largely because of a carbon dioxide sensor glitch on Chamitoff's suit that cut the mission's first spacewalk a bit short. Since the exercise technique takes slightly more time before the start of the spacewalk, flight controllers chose to stick with the campout procedure to make sure Chamitoff's suit is in good shape should the sensor glitch reoccur. Endeavour's six-astronaut crew is in the homestretch of a 16-day mission that delivered a $2 billion astrophysics experiment and other supplies to the International Space Station. The shuttle launched May 16 and is due to return to Earth on June 1.